When it comes to the Matildas team there are many figures who quietly and professionally perform their duties in the background without fanfare. One of those background figures is Dr James Ilic. Based in South Australia, for over a decade and a half, four Women’s World Cups, four Asian Cup campaigns and also the 2004 Olympic Games in Athens, "Doc" has brought an invaluable wealth of experience he brings to the Matildas outfit. The Women’s Game caught up with Doc ahead of the team’s departure for Brazil next week, to gain insight into his role with the national team. Dr. Ilic, thanks for your time. Can you talk us through what a typical day look like for you looks like on tour or at a tournament? I get up early, probably around 5 or 5:30am and go for a run on the hotel treadmill, and I find that helps just to get me ready for the day. We have set meals, breakfast lunch and dinner, we have a training time, and it often takes a half hour or more to get to the venue. We train for about two hours and come back so that takes out a fair part of the day. We also have team meetings, probably one a day on average, and then the physio’s and myself have treatment periods, where we need to assess players on a daily basis to determine where the players are at. How difficult is it to monitor nutrition and hydration when you are in a foreign country? We consume all meals in the hotel and only use bottled water. We also monitor the players’ hydration status when away on trips. In terms of food, for the Olympics we have the benefit this time, of taking a chef with us. The Socceroos have a chef who is Brazilian, and he came with us to Japan for the Olympic Qualifiers. He was an enormous help in terms of food and nutrition. Obviously one of the main headlines for the upcoming Olympic Games has been concerning the zika virus. How are you feeling in the lead up to the Rio Olympics and are there any extra precautions you will be taking in light of the situation? Obviously I’m looking forward to it but at the same time I have some concerns about the conditions in Brazil from a medical point of view. The usual precautions we take when we go to Asia we will take also in Brazil, such as using only bottled water for drinking and brushing teeth and using alcohol hand wash. The team is very familiar with these practices. Brazil also has the added layer of mosquito borne infections like dengue fever, yellow fever and the zika virus. All of the team has been vaccinated against yellow fever, hepatitis A, hepatitis B, typhoid and cholera. The team have become very good at travelling through Asia, but as I said I think Brazil will be a slightly different challenge. Is it difficult medically to constantly fly into different seasons? The team as a whole copes with travel very well. As a team we have huge challenges like long distance travel, jet lag, risk of infection, water supply, air pollution and humidity. Probably the only thing we don’t deal with on a regular basis is the issue of altitude. What are the most common types of medical issues you deal with in your role, and has this changed at all with the introduction of AstroTurf? I think most doctors who travel with teams would say that a significant amount of their time is spent dealing with general medical illnesses. You see a similar range of injuries, whether we are at home or travelling. We probably haven’t played enough on synthetic surfaces to see a trend with injuries. Like you mentioned, Alen Stajcic has had significant success since his appointment as Head Coach of the Matilda’s in 2014. What kind of collaboration goes on between the head coach and the medical staff? We talk often, and once a day I will run through the list of players and where they are in relation to training the next day. It is very much a collaborative effort in terms of what they can do. Most of the time we would try and get the player to do something active, whether that’s on the exercise bike or an upper body workout in the hotel gym. When travelling overseas I suppose you need to be prepared for all circumstances. How much medical luggage do you take on a Matildas trip? I have two large suitcases that I take. My own personal luggage occupies about a third of one of those suitcases, the majority of it being medical equipment. Most of the places we visit have good medical facilities, but I still need to have emergency medical equipment, general medical equipment and a large range of medications. I try and cover most circumstances because we certainly can’t purchase medication in Asia because of the risk of contamination, or the US for that matter. My general principle is I don’t get any medicine overseas, because I can’t guarantee its quality. The medical decision regarding the fitness of a player would still be the same regardless of the tournament. For example it may be that a player will not be fully fit for the entire tournament, and then it’s still the coach’s decision whether they pick them or not. Fortunately at the moment, majority of our players are not injured. There’s no doubt that professional female soccer players in Australia have had a difficult time being recognized for their work and dedication to the game. In the past many have had to juggle national team commitments with full time work. Bearing this in mind what do you think that it would mean to the Matildas, past and present, for the team to medal in Rio? I think it would be an enormous boost to their cause. Ultimately what they want to become is full time athletes, and be able to make a career out of it. Compared to when I started they are a long way down the track toward achieving that. For the players who have been around a long time like Lisa, she would also be aware of the enormous advances. Even still, the sport faces huge challenges. The women’s game in Australia has a number of competitors including the AFL women’s league. The AFL has significant funds, and will probably look at all other sports to recruit athletes, including soccer. [Laughs] Yes, it’s difficult because we don’t see much more than the training ground, the hotel and the airport. The place that I found most interesting was North Korea. It’s not a place I would want to go to as a tourist, and certainly the last place on earth you would want to live, but it is a unique place to visit. No mobile phones, no computers, one TV station one radio station. It’s just a completely isolated country. In terms of ease and familiarity countries like Canada, the US and Europe would be among the top. While sitting on the sidelines watching the Matilda’s for the last 15 years you have been privy to some unbelievable footballing moments. Which one stands out the most to you? There have been some very good moments. My position is probably slightly different from other staff in that I tend to watch games from a medical and injury point of view. I have to watch slightly behind where the play is, to make sure people get up when they go down. There have been some good moments, probably qualifying for this Olympics was the highlight for a lot of the team because we hadn’t qualified for the previous two Olympics and it is very difficult to qualify through Asia. Apart from the European Qualification it’s probably the strongest group. So it was an enormous effort from the players and the coaches. 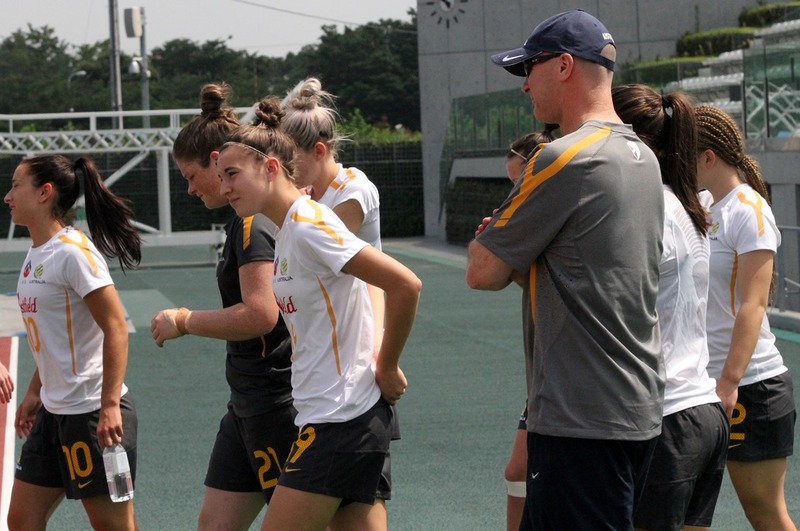 What do you most enjoy about your role with the Matildas? We have a good team environment. I think to take part in a team sport where you travel a lot the staff need to get along well, and we do, so that makes life easier. We are all working towards the same goal. Obviously the head coach makes the final decision, but we all have input into what happens. So I think working with a good support team is rewarding, if I didn’t enjoy that part of the experience, it would be hard to continue on. It is good to see the way the Matildas have evolved from when I first started, from a relatively minor sport to now a mainstream sport. Women’s soccer in Australia has seen unbelievable growth in the past decade. Where do you see the game in 10 years? On the field I think with the way that they are progressing [with their top 5 ranking] the challenge for them will be maintaining that position and then at some stage breaking into the top two or three teams in the world, which I think is achievable for them. I think off the field the main challenge is to become full time athletes. Performing well at the Olympics will help that cause.